I am constantly being told that I am a very lucky man - usually by my wife, though other, perhaps less biased, observers do chip in from time to time to back her up. But even at my most cynical moments, I can see how fortunate I am to share my life with someone who knows the answers to absolutely everything. Which is all the more remarkable when one considers that this repository of omniscience is only three. At some point one of us is going to have to explain what actually goes into the sausages and fish fingers that are currently just about the only things he will eat, apart from lightly disguised refined sugar and – bizarrely – smoked salmon. But I am certainly not going to volunteer for that assignment, because I don’t suppose he will be any more willing than the rest of the great British public to believe me when I try to offer reassurance on the quality of processed food. Having spent the last 35 years mainly working on and for food companies, first as an investment analyst and then as a public relations consultant, I have undoubtedly visited more production lines than the average citizen, and I can offer this insight: I have never once been deterred from eating products like pies, pasties or sausages by seeing what went into them or the way they were handled. I confess that I always ducked invitations to view that essential part of the process that sees live animals converted into meat. If I had to kill my own, I might well become a vegetarian tomorrow. But since meat exists, and is delicious, it would require much stronger principles than mine not to indulge in it. True, I have never visited a burger production line, the focus of so much recent angst, but I cannot imagine that different principles apply there. The food industry has its pirates and corner-cutters, like every other, but no mainstream British food manufacturer or retailer would ever set out to con its customers by deliberately flogging them a dead horse. 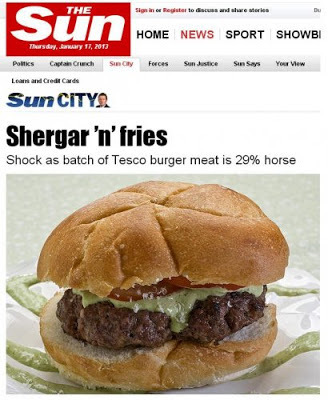 Perhaps the most interesting thing about the Horsegate imbroglio is how hard the media has found it to whip up (no pun intended) hysterically aggrieved consumers. Most of them seem more interested in cracking jokes, some of which have been rather good. A surprisingly high proportion also seems open in principle to eating horsemeat, if it were properly marketed as such. I am not amongst them, but only because my views on what constitutes acceptable food were set in stone more than half a century ago. To this day I cannot bring myself to eat rabbit, which my mother ruled out because of then rampant myxomatosis, and I remain childishly sceptical of most seafood that doesn’t come coated in breadcrumbs or batter. Our 11 month old cheerily shovels down anything he can get his hands on, and would be as unfazed by horse as the hungriest French paysan. But then I seem to remember his elder brother took the same omnivorous approach at that stage, before his focus on sausages and fish fingers developed. Maybe we could get him some therapy on this when he goes for counselling about the trauma of watching a puppet impersonate Jimmy Savile on CBBC’s Tweenies on Sunday morning. A great cue for more outrage, this time on the failings of the BBC, even though precisely none of CBBC’s target audience would have the slightest clue who Jimmy Savile was. The simple fact is that, even in the best-run organisations, mistakes occasionally happen. We should calmly find out why, to ensure that they do not occur again. If anyone would like to borrow a small person who knows absolutely everything to help with the investigations, please just let me know.